Mike Toth's 6-year old son,Theo....A future goalie for the East York Penguins? One of the big questions surrounding our Canadian men's hockey team heading into the Russian Olympics? "How will our goaltending hold up?" Carey Price and Roberto Luongo are pretty darn good, but most hockey insiders give the edge to teams such as Sweden and Finland when it comes to Sochi 'tenders. It's tough to find good Canadian goalies. In Quebec, a lot of young guys grew up dreaming about becoming the next Patrick Roy or Martin Brodeur. But with Roy now an NHL coach and Brodeur on his last legs, even the La Belle Province goalie pipeline has dried up. In the Toronto eight-year-old house league I coach in, little masked men are extremely hard to find. Only half the teams have a regular goalie and our guy, "King George" (who you met in an earlier blog) slapped on the pads for the first time in his life this season. Fortunately, I was also a goalie during my playing days and have been able to pass on a few basic "tricks of the trade" to George. But teaching him about the "butterfly" style and "push and slide" system that most modern goalies employ? As I've told George, I can barely get down on my banged up old knees anymore, let alone slide around on them. Beyond the basics, there's no question goaltending has undergone some massive changes. In the old days, coaches constantly screamed at their goalies to "Stand up!" In fact, NHL hall of famer turned minor pro coach Eddie Shore used a special "stand up" drill on his Springfield Indians puck stoppers. Old Eddie would actually tie a rope to the cross bar, wrap it around the goalie's neck, and if he went down once, the poor guy would strangle himself into refraining from going to his knees a second time. Nowadays, goalies have lots of rope when it comes to getting down and dirty. Most NHL goalies spend the majority of time on their knees, relying on their huge pads to take away the bottom of the net while their oversized shoulder pads and gloves deal with everything up top. And while it's a popular method in the big leagues, it also works pretty well at the youth level. 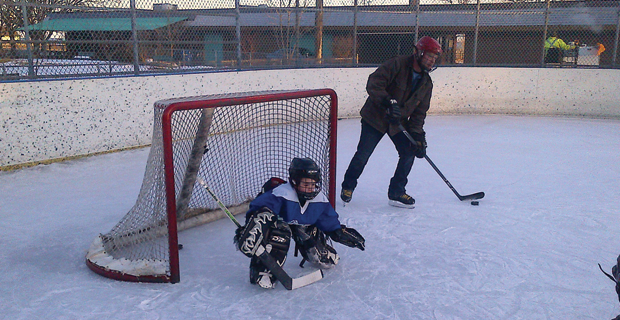 I have a nephew who was a pretty good little Tyke goalie, and his game plan was very elementary. Since most five- and six-year-old kids can't raise the puck, Jordan would simply lay down in the crease the entire game and smother every black biscuit that came his way. Lazy? Yes, but very effective. Last week, my six-year-old slapped on the pads for his Tyke team and, to be honest, the little guy put on quite a show. His team lost 3-2 but it could have been a lot worse, as he stopped a ton of rubber. And up in the stands? Dear old dad was busy screaming "Lay down!"